The Lessons Learnt and Reconciliation Commission (LLRC) report, along with the National Action Plan to implement the recommendations of the LLRC (Action Plan), are the two key documents produced by the Government of Sri Lanka (GoSL) outlining its process of reconciliation after three decades of war. Over two years have passed since the Cabinet approved the Action Plan in July 2012; nearly three years since the LLRC report was presented to the President in November 2011, and five years since the end of the war. In February 2014, the Centre for Policy Alternatives (CPA) conducted a critical study of the implementation of the LLRC recommendations, which illustrated the piecemeal progress made by the GoSL. Here, CPA highlights statements by key Government officials on the progress of implementation of the LLRC. It is noteworthy how Minister Mahinda Samarasinghe in March 2013 claimed that 99% of the LLRC Action Plan had been implemented, with President Rajapaksa claiming in May 2014 that only 30% had been implemented. 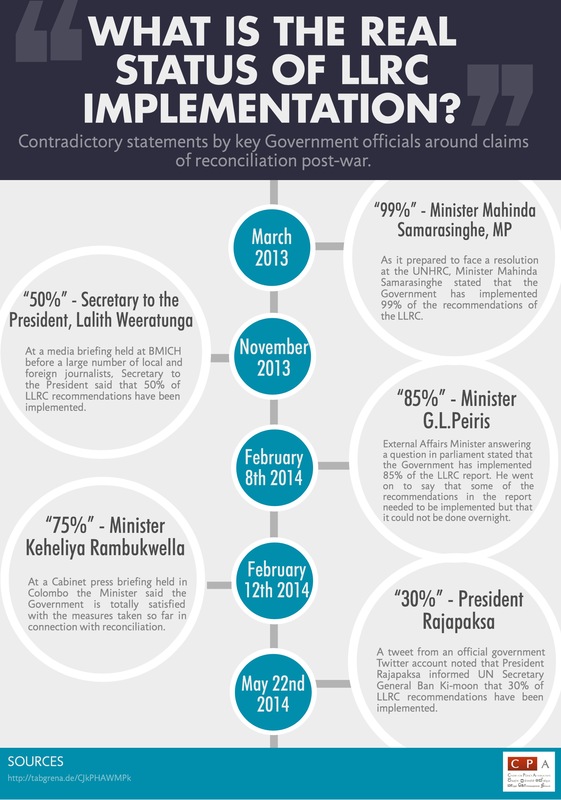 These discrepancies highlight the lack of clarity across the GoSL on reconciliation efforts. More importantly they highlight not only the illusion of progress the GoSL is attempting to depict in terms of reconciliation, but also the lack of a genuine commitment on its part to implement the LLRC recommendations. Download this info graphic as a high resolution JPG or PDF.